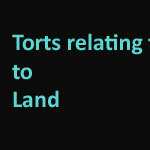 Common law torts relating to land. Certain torts at common law are designed to protect interests in land specifically, and may be available where the tort of negligence is not. They are torts of strict liability (no lack of care needs to be proved). Furthermore, they can include where the only damage caused is to the claimant’s enjoyment of his land. On the other hand, however, these torts have particular limitations that negligence does not have. This recording begins by introducing the different torts included in the lecture, identifying the broad circumstances in which each might apply. The purpose of this is to help a student to decide, in a given scenario, which actions are worth considering in more detail and which are not. • private nuisance, which forms the major part of this recording. • public nuisance. Unlike the private form of nuisance, public nuisance is not a tort protecting land specifically but is, nevertheless, often relevant in similar circumstances.